Position the cash register near the door, so that customers are not forced to walk through the store again after paying, putting your merchandise at risk. The customers are seen both entering and exiting the store. Don’t use open baskets, grid wall or slat wall in displays near the door. These are too easy for people to put into their pockets on the way out the door. Install two-way mirrors so that you or your staff can see around blind corners and tight shelving. Use shorter shelving units throughout the store, so that you and your employees can see overtop of them and see who’s in the aisle. Use taller shelving or gondolas against the wall so that no one can fit behind the shelves. Do have video surveillance of the inside and outside of the store, as well as the entry way area. Review this footage daily. Use the higher areas of a display for more expensive or more frequently stolen merchandise. It will be more of a deterrent if it’s not within the customer’s reach. Invest in display cases that have a lock and key, and house valuable merchandise in those cases. The merchandise should only come out of the case when a customer is interested in seeing it, and then only under employee supervision. Post signs stating, “Shoplifters will be prosecuted.” Have a policy for theft and shoplifting. Monitor your employees carefully and discourage fraternizing on the job. 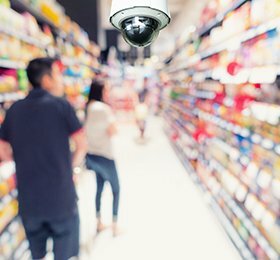 You can get their buy-in with a security incentive program – let them scrutinize the store floor, and for every security violation they see, challenge them to make it better. Teach your staff not to be distracted at the cash register or anyplace else they’re handling customers.